The Pawn Shop Mesa, Arizona Trusts! WELCOME TO THE BEST PAWN SHOP IN MESA! Our pawn shop proudly offers pawn loans on everything of value! With one stop, you can buy, sell, or pawn anything of value you might have. We pride ourselves on always paying more cash than the other Mesa pawn shops in our loan value. You can get the most cash almost instantly for whatever item it is that you have! Whether you need a pawn loan, gold loan, diamond loan, electronics loan, musical instrument loan, estate jewelry loan, video game loan, or a watch loan; we’re here to serve you with the lowest interest rates and the highest loan amounts in Mesa. Our quality service isn’t just for Mesa, but also her sister cities Tempe, Chandler, Gilbert and more. In fact, people from all over Arizona come to our Pawn Shop in Mesa. That’s a testament for our high loan values and excellent service. That’s why we’re Mesa’s Best Pawn Shop. Check out our reviews, and obtain fast cash with a cash loan on almost everything including Gold, Jewelry, Diamonds, Fender Guitars, Tools, cars or motorcycles. A pawn loan is typically written out for the period of 90 days, during which time you are only required to make minimum payments on your pawn loan. These payments are simply only interest, and your interest rate is negotiated when you bring in your item. The higher the loan value, the lower we can be on your interest rates. We boast the lowest interest rates for any pawn shop Mesa, and will always do the most in our power to ensure you’re getting the maximum value for your item. We’re the best pawn shop Mesa has to offer, and are here to serve you. Mesa’s Leading Gold Buyer. Highest Prices Paid. At our Mesa pawn shop, we’re the top gold buyer in town. We consistently survey our surrounding competition to ensure we’re paying higher than them. Our cash for gold prices are updated on a daily basis according to what it is selling for in the global market. This way, you can get fast cash for gold, and rest assured that you’re getting the amount you deserve for your gold. Whether it’s gold jewelry, gold bars, gold coins, gold whatever, we’ll give you the highest price for your item. Our associates are gold trained professionals, and have near a decade’s worth of experience dealing with gold. Not only will you get the best price, but you might just learn something new about the gold you have. This is what allows us to pay so much higher than any other gold buyer in town. The fact that we’re trained, experienced, and looking out for our customers more than our own profits makes us the best pawn shop Mesa has. Our gold buying services are the best way to get cash for gold for whatever financial need it is you have. While our gold buying process is still pretty fast, it’s more thorough than you’ll find among most of our competitors. We’ve find that the more accurate the appraisal we’re able to make on your gold, silver, or diamond jewelry, the higher a percentage we pay. The reason why it’s important to understand the difference between simply paying the most cash, and paying the highest percentage, is because of how gold is bought and sold by pawn shops and jewelry stores. We all use what is known as a gold spot price which is what people all over the world are buying and selling kilograms of gold for. Since this is a global number, all pawn shops are working with the same information — the difference comes in what percentage of that amount they decide to pay. At Oro Express Mesa Pawn and Gold, our gold jewelry appraisals are as thorough as can be so that we’re confident in the price. The more accurate we feel our assessment is, the higher gold gram percentage we’re able to pay you. If you’ve got gold to sell in Mesa, Tempe, or Chandler, we’re the only pawn shop you should visit. Paying the most cash for gold seven days a week, Oro Express Mesa Pawn and Gold is the best pawn shop Mesa has to offer. With over a decade of gold, silver, and platinum experience, we’ve truly become the experts in Jewelry Buying. Our jewelry buyer associates will ensure that not only are you getting the best prices for your jewelry, but that you’re getting the best service at any pawn shop you could hope for. Whether you have diamonds, rubies, sapphires, emeralds, gold, platinum jewelry, whatever! At our Mesa pawn shop, we only employ top professionals from around the Valley of the Sun. Each and every employee that is responsible for handling jewelry will have years of jewelry buying experience under their belts. Each and every piece of jewelry is unique, and different, particularly when it comes to gold and all the different types. From rose gold to white gold to yellow gold, we know what we’re talking about. Our thorough appraisals ensure that we’re confident about the value of your jewelry, and thus confident about the cash offer we can give to you. What’s special about Oro Express Mesa Pawn and Gold is that we offer a variety of financial tools to help our customers get back on their feet. We understand jewelry can be a precious and sentimental item to many people, and even if facing financial hardship it can be one of the last things we want to see go. Diamond rings are pretty much only bought for sentimental events like weddings in the first place. At our pawn shop, we’re more than happy to offer any customers a jewelry loan instead of having to outright sell their item. We never want to pressure a customer into a situation they are simply unhappy with, so are more than willing to work with you and your gold, silver, or diamond jewelry. This jewelry loan simply allows you the option to reclaim your jewelry at some point within 90 days from that day. This provides any resident of Mesa, Tempe, or Chandler plenty of time to reclaim the financial stability they once had. The best part about our jewelry loan services is that even if you’re not ready to repay the loan in its entirety at the end of the 90 days, we can renew the pawn loan for another 90 day period to give you adequate time to find financial stability. 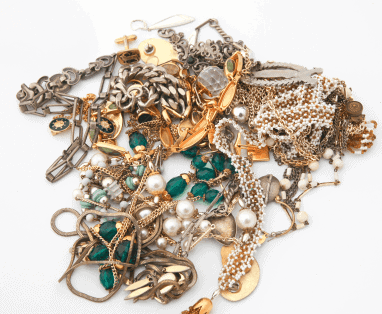 Don’t Sell Your Valuable Jewelry For SCRAP! Don’t sell your jewelry for scrap money! Come to us and sell it to someone who can pay more for it because we are better at marketing it. We’re here to help. With decades of experience, we’re ready to be your gold buyer, silver buyer, estate jewelry buyer, and diamond buyer. Offering the most prices for all kinds of jewelry, our pawn shop is ready to buy jewelry in Mesa, Tempe, Scottsdale, Chandler, or Gilbert. So, if you need fast cash and have old, estate jewelry you’d like to sell, our pawn shop is the best pawn shop for you. As a full service Mesa pawn shop, we also offer Mesa auto title loans. We don’t simply offer auto title loans out of our pawn shop; our auto title loans are handled through Phoenix Title Loans, LLC. This helps us in ensuring that we get you the maximum value for your vehicle. Our associates experienced in assessing the value your car. An auto title loan is the quickest, easiest way to get the fast money that you need. We’ll happily loan up to $25,000.00 on a single car! The car is evaluated by its condition; simple enough. But the entire process will usually take less than a half hour, and you can leave with not only your car, but also the money you need. Our Partner, Phoenix Title Loans, LLC! Phoenix Title Loans, LLC, provides great information to help educate you on how to get the most cash for an auto title loan. If you visit Phoenix Title Loans, it’ll tell you how you can ensure you’re getting the most money for your auto title loan. They also have a great article on how you can minimize the interest rate (and get the lowest interest rate in town!) here. The process to get an auto title loan is easy, and painless, no matter if you’re from Mesa, Chandler, Gilbert, or Tempe. For an auto title loan, you can borrow what you need and pay off the balance due when you are ready. There is no penalty, hassle or restrictions. You don’t need to get locked in somewhere else! Get an Auto Title Loan in Mesa at the best pawn shop, Oro Express. Getting a loan takes under half an hour, and can really get you out of the financial burden you’re in. We’re the best pawn shop Mesa has to offer, and are here to serve you.